dr. Hsieh is Interim Department Chair, Research Professor and Founding Director of the Center for Global Entrepreneurship at SUNY Korea in Songdo, South Korea. He publishes and researches a wide variety of topics, ranging from the effects of training and education on self-employment, to the value of patented inventions, to the effect of cultural industry on modes of entrepreneurship. His work has appeared (or is forthcoming) in Organization Science, Entrepreneurship Theory & Practice, Journal of Management Studies, Small Business Economics, Scientometrics and others. He has been invited to give academic talks at the Kauffman Foundation and at universities in eight countries. He has served as a judge for the Innovate!100 global competition (videos found here), and he regularly guest lectured entrepreneurship at both the Amsterdam Medical Centre and BioBusiness Summer School (July 2013 pictures). He provides consulting services to a variety of ventures and corporations (most recently at Allianz, pictures here). Since 2014, he has given guest talks every summer for the KGEB Entrepreneurship Camp. 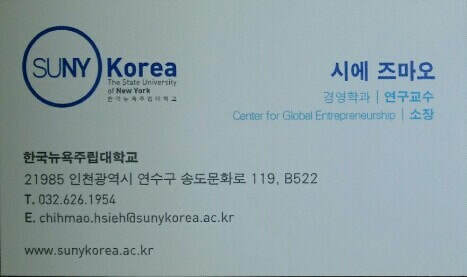 At SUNY Korea, dr. Hsieh teaches business, management, and entrepreneurship courses. Previously in his career, he was on the faculties at Yonsei University, the University of Amsterdam (tenured August 2014), the University of Missouri, and Washington University in St. Louis. At those institutions, he taught entrepreneurial management and finance to undergraduates, MBA's, and for Executive Education, in addition to designing, executing, and coordinating entire entrepreneurship minors. Hsieh 박사님은 현재 연구부장과 한국뉴욕주립대학교에서 글로벌 창업센터의 설립 개발자 입니다. 그는 교육 및 교육의 자영업 효과, 특허 발명의 가치, 감정과 기업가 정신의 관계에 이르기까지 다양한 주제를 발표 및 연구합니다. 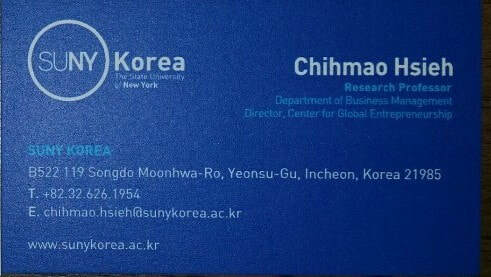 그의 연구는 “Organization Science”, "Entrepreneurship Theory & Practice", "Journal of Management Studies", "Small Business Economics", “Scientometrics” 등에 개제되었습니다. 그는 카우프만 재단 (Kauffman Foundation)과 8 개국의 대학에서 학술 회담에 초청 받았습니다. 그는 Innovate! 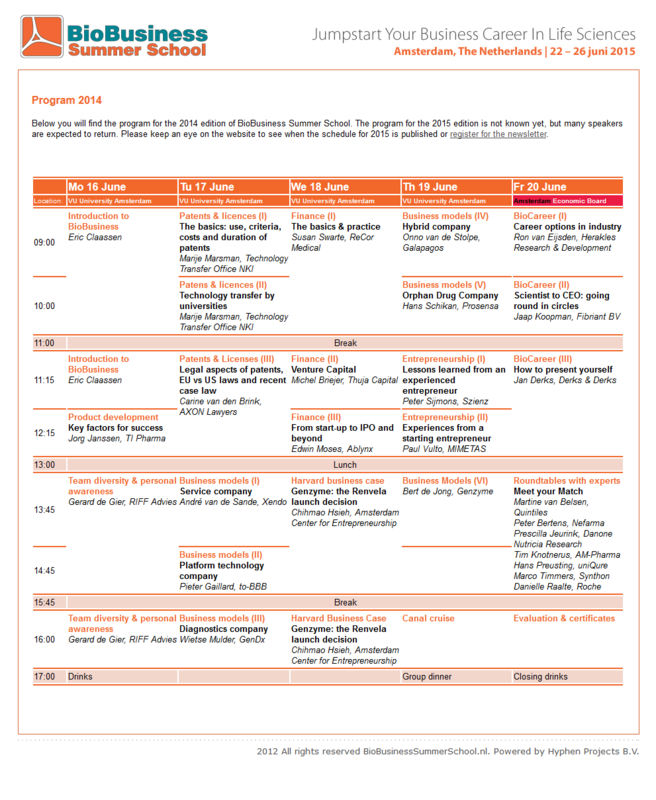 100 글로벌 경쟁 판사로 재직했으며 암스테르담 메디컬 센터와 BioBusiness Summer School에서 기업가 정신을 강의했습니다 그는 다양한 벤처 기업 (가장 최근에는 알리안츠)에 컨설팅 서비스를 제공합니다. 2014 년부터 매년 여름 국민 글로벌 창업 부트캠프에서 게스트 회담을했습니다. SUNY Korea에서 Hsieh박사 님은 비즈니스, 경영 및 기업가 정신 과정을 가르칩니다. 그 전에는 연세대, 암스테르담 대학교 (2014 년 8 월 재직), 미주리 대, 세인트루이스 대 워싱턴 대학교 등에서 교수직을 역임했습니다. 이러한 기관에서 그는 기업가 정신 미성년자를 설계, 실행 및 조정하는 것 외에도 학부생, MBA 및 경영 교육에 기업 경영 및 재무를 가르쳤습니다. A February 2013 profile of dr Hsieh's UvA course can be found on p. 42 of this issue of Folia. A May 2016 profile of his research can be found in that month's issue of the Yonsei Newsletter.